Our Bariatric Incontinence Pants are specially designed for maximum comfort and fit to prevent leakage on larger waist sizes. Incontinence is a condition that affects millions of men and women of different ages in the UK. At Allanda we are dedicated to providing reliable incontinence products that can help you manage your condition daily, so you can lead a normal and confident life. As part of our extensive range of high quality incontinence products, we also offer disposable adult incontinence products, including a selection of Bariatric products, available below. Sourced only from trusted manufacturers such as TENA or Prevail, these disposable bariatric incontinence products are perfect for larger waist sizes and they offer increased maximum security against leakage. 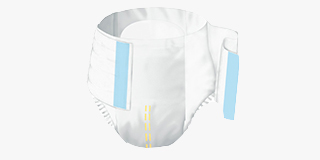 We offer bariatric incontinence pants that are suitable for different types of incontinence, from moderate to heavy or continuous incontinence, with their absorption levels ranging between 6 and 8. If you are not too sure what is the best product for you, don’t hesitate to contact us on 0800 999 556 and we are happy to help you choose the most suitable products for your personal needs.